NAIROBI, Kenya, Jun 30 - Doctors treating Prime Minister Raila Odinga on Wednesday said that he would take some time before he resumes normal duties. Neurosurgeon Dr Oluoch-Olunya said that the PM who was to remain hospitalised for the next four days would need some rest at home after being discharged from Nairobi hospital. He however assured that the Premier was responding well to treatment. “The PM had a good night last night, woke up this morning brighter, we were able to change his dressing, everything has been removed and he is not in any pain,” the doctor said. “We have taken off all the drips and all his medication now will be oral, he has had the opportunity to do exercises this morning and as far as we are concerned he is moving according to plan,” said Dr Olunya. He said that the visiting hours had been limited to two hours a day- one hour in the morning and another hour in the evening- to allow the PM take ample rest. “Whoever comes to see him will only be allowed for short periods of time because we want him to recover appropriately. We are emphasising that he should be given a chance to rest and we are restricting the number of visitors to see him,” he said. The doctor confirmed that the PM was suffering from a chronic subdural haematoma which he said was a delayed blood clot outside the surface of the brain. Government Spokesman, Dr Alfred Mutua said the PM urged the team working on the Green campaign not to relent on the campaigns. “The Prime Minister is very keen and would like to communicate to the country that he wants the team that is on the ground especially working to get a new Constitution to push on and not to stop and that he hopes to join them very soon,” Dr Mutua said. The PM was hospitalised at the Nairobi hospital on Monday evening where he underwent head surgery to relieve build-up of pressure near his brain. The doctors said that the Premier had hit his head against the door of his car about three weeks ago. Prime Minister Raila Odinga is recovering at the Nairobi Hospital after he underwent head surgery, his doctors said on Tuesday. The operation, which they described as minor, was done on Monday night, and was meant to relieve pressure, which had built up outside his brain, Dr Livingston Oluoch-Olunya, a neurosurgeon, said at the hospital. Mr Odinga was driven to hospital at 6pm by his driver, complaining of a headache and general fatigue. “Following examinations and initial investigations, he was found to have a build-up of pressure outside the brain leading to headache,” Dr Oluoch-Olunya said. “A team of doctors got together, and within a short period, it was agreed that a minor procedure be carried out on the left side of the head to relieve the pressure,” added Dr Oluoch-Olunya, who was accompanied by Dr Mahmood Qureshi, another neurosurgeon. The pressure may have been caused by the PM banging his head in his car some weeks ago, the doctor said. Dr Oluoch-Olunya added that Mr Odinga was not in any danger and was “doing just fine” but will be in hospital for five days. “I would like to assure the country that he is actually well. The headache that he had yesterday has all been cleared.” Dr Cleopa Mailu, the Nairobi Hospital’s chief executive officer, was present during the briefing. Earlier, the PM’s press team issued a statement saying he was being treated for fatigue. Mr Odinga, who is 65, is one of Kenya’s most energetic politicians and will normally have a punishing schedule every day. Deputy PM Musalia Mudavadi will preside over two engagements which the PM was scheduled to attend on Wednesday and Thursday. His last engagement on Monday was at the clean-up of the Nairobi Dam, where he looked exhausted and ill.
“Immediately after his function at the Nairobi Dam last (Monday) evening, the PM went to Nairobi Hospital for a check-up because he felt some general exhaustion. After tests, doctors started treating him for fatigue,” said his press secretary Dennis Onyango. Mr Onyango had said Mr Odinga was fit enough to return to work. “The doctors have assured us that the PM is in good enough condition to come to office and work as usual if he feels like. But they are not allowing that. They strongly recommend that he takes the rest,” he said during a press briefing at the Treasury. Doctors and the family had requested that access to the premier be restricted. “The doctors have further recommended complete bed rest for a few days and they will confine him in hospital for that period. During that period, the hospital will restrict access to him to ensure he gets the rest that he needs,” he said. 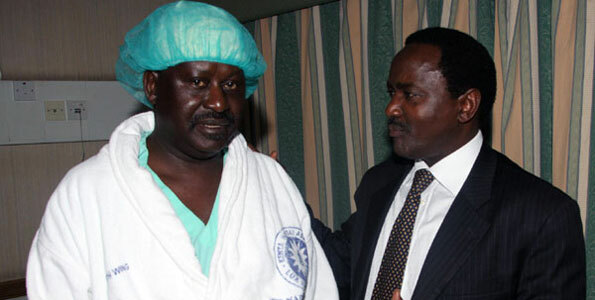 On Tuesday, high profile guests, led by Vice President Kalonzo Musyoka, visited the PM to wish him quick recovery. They included Cabinet ministers Anyang’ Nyong’o, Dalmas Otieno, James Orengo, assistant ministers Alfred Khang’ati, Oburu Oginga, Ayiecho Olweny, Simeon Lesrima and James Gesami. Also present were US ambassador Michael Ranneberger, Finance PS Joseph Kinyua and Mohammed Isahakia of the PM’s office, MPs Millie Odhiambo, Fred Outa and Edick Anyanga among others. Mr Ranneberger said Mr Odinga was doing fine and was in high spirits. “He is very active. I have just seen him. He is in fact enjoying the World Cup,” Prof Olweny said. Ms Connie Sigei, his sister-in-law said the PM was doing fine. 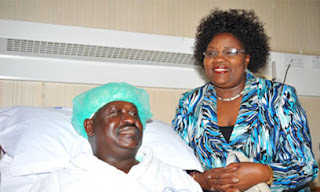 “He even ate boiled maize I had brought him.” The last time Mr Odinga was admitted to hospital was in April 2008, when he had an eye operation in Germany. Mr Odinga’s illness comes at a critical time in the referendum campaigns when the ‘Yes’ team that he leads with President Kibaki has resolved to aggressively rally the public behind the proposed constitution. On Monday, he attended the ‘Yes’ campaign strategy meeting at the Kenyatta International Conference Centre in Nairobi during which the ‘Greens’ agreed on a plan to counter the gains of the ‘No’ team. “The PM is an active person and he is the kind who can have five functions in a day and attend all of them,” Mr Onyango said. The ‘No’ team on Tuesday came face to face with a hostile audience who censured them for their stand on the proposed laws. In the first debate organised by the Kenya Alliance of Resident Associations (KARA), Dr Tom Namwamba, the head of the ‘No’ secretariat, on Tuesday had a hard task selling the team’s stand to the audience from the private and public sectors. The ‘Yes’ team, represented by Prof Peter Wanyande and Mr Mutakha Kangu, accused their rivals of lying about the contents of the proposed constitution. The Greens also claimed that their rivals were spending a lot of time and resources on peripheral issues that have little to do with the constitution debate. Former Constitution of Kenya Review Commission (CKRC) chairman Yash Pal Ghai moderated the session at the Panafric Hotel on the topic “Understanding the Arguments of Green and Red: Isolating the Myths from Facts”. Apart from Dr Namwamba, the Red team was also represented by Prof Jesse Mugambi of the University of Nairobi. Prof Mugambi said the kadhi courts give undue advantage to one religion over others. “It would only be wise to put off the referendum until we can agree on the same things,” he said. The proposed constitution did not have the aspiration of Kenyans, Dr Namwamba said amid boos and jeers. “You must listen to all the voices even if you don’t like it,” he charged at the audience during the plenary session. On his part, Prof Wanyande said politicians rejecting the proposed law are major beneficiaries of past illegal deals. A member of the audience, Dr Tom Wolff, told the Red team to come up with a counter draft of issues as they would want them in the proposed constitution. KARA boss Stephen Mutoro asked the Interim Independent Dispute Resolution Court not to interfere with the referendum date. Prime Minister Raila Odinga Tuesday underwent a successful minor surgery on the left side of his head. The PM checked into the Nairobi hospital on Monday evening complaining of a headache and general fatigue. Nairobi hospital neurosurgeon Dr. Oluoch Olunga who operated on the PM said he was recovering well. Initial investigations indicated he had a buildup of pressure outside the brain leading to the headache. Mr Olunga said the pressure might have been caused by him hitting his head while in a car three weeks ago. "I'd like to assure the country he is actually well," he said. "He is sitting comfortably in his room." Raila was admitted at the Nairobi hospital immediately after attending an environmental forum at the Nairobi Dam. The PM said he never expected to be booked in when he checked into hospital and had looked forward to a quick routine treatment then leaving the hospital to go and watch the World Cup matches. The doctor has advised that visitors to the Prime Minister be restricted to allow him to recover speedily. "The doctors have further recommended complete bed rest for a few days and they will confine him in hospital for that period. During that period, the hospital will restrict access to him to ensure he gets the rest that he needs." The staff in his office said they had visited him at his hospital bed Tuesday morning where they also had a briefing session with the doctors who assured them that he was in a stable condition. "They assured us that the PM is in good enough condition to come to office and work as usual if he feels. But they are not allowing that. They strongly recommend that he takes the rest," his office said. Mr Odinga has been prime minister since 2008 under a deal brokered to end months of violence after his supporters claimed he had been cheated of victory by allies of President Kibaki. NAIROBI, Kenya, Jun 29 - Doctors treating Prime Minister Raila Odinga have said that he underwent head surgery to relieve a build-up of pressure near his brain. His doctor Oluoch Olunya told reporters at the Nairobi Hospital that the Premier hit his head against the door of his car a few weeks ago. “The Prime Minister checked into our hospital last evening at around 6pm complaining of headache and general fatigue. The Prime Minister remembers hitting himself against the car door a few weeks ago,” Dr Olunya said. Dr Olunya said the hospital had decided to restrict access to him to allow him recover fully. Mr Odinga had spent the better part of his Monday at a Yes parliamentary group meeting strategising on campaigns in support of the Proposed Constitution before heading to the Nairobi Dam from another official engagement. The Premier has in the last months operated a tight diary of official and political engagements across the country and abroad. The PM who is leading the Yes campaign on the Proposed Constitution with President Mwai Kibaki has been on the campaign trail throughout the recent past sometimes leading up to four rallies in a day. Last weekend he was in western Kenya to drum up support for the draft holding rallies in Bungoma and Kakamega. The other weekend he led the campaign in Nakuru and Machakos. Earlier in the month Mr Odinga was in South Mugirango to campaign for Orange Democratic Movement candidate Ibrahim Ochoi in the June 10 by-election. The referendum campaigns have put him on the spot lately as he has been busy warding off perceived divisions in the Yes team amid accusations that he is taking all the credit for the campaign and use the passage of the new draft as a 2012 strategy. The last time the PM sought medical attention was in 2008 when he underwent a laser eye surgery in Germany. Foreign Affairs Minister Moses Wetang’ula on Monday said he is going to seek Prime Minister Raila Odinga’s intervention over last year's move by government to halve tourist visa fees. The minister said the decision to cut the visa fees by 50 per cent was made by Tourism minister Najib Balala and the Treasury, without his knowledge or even the concurrence of his Immigration counterpart Otieno Kajwang’. Mr Kajwang' also raised the matter on Monday with Parliament's Committee on National Security. He said the decision was responsible for some of the unfinished projects in the ministry. The minister wants the Prime Minister, as the supervisor and coordinator of government, to revoke the visa directive because it was erroneous in the first place. He accused the Treasury for failing to reimburse the money lost as a result of the decision that took effect in April last year. “It should have been for a specific period, due to the post-election violence, but it now looks open-ended,” he said. Committee chairman Aden Keynan and members George Nyamweya and Benedict Gunda, said the decision was faulty and had to be rescinded, to allow the government to collect all revenue due to it. The minister asked the committee to push for more funds to ensure it improves Kenya’s image abroad. “If you go to other countries and you rent property (embassy and chancery), your prestige is lost,” said Mr Wetang’ula. The committee also explored how Kenya can buy property to house its envoys, with guaranteed loans being explored. But this will require the approval of Parliament. This followed revelations by the minister that their request for Sh400 million for chancery in Geneva, Sh150 million for one in Kampala, Sh786 million for one in New York and Sh300 million for one in Khartoum. Even after Rwanda gave Kenya a 2.5 acre piece of prime land in Kigali, the minister said, Treasury had just allocated Sh200 million to build a chancery and start building a trade centre. “If we own property, we save millions in rent,” he said. The other option, the minister said, will be to take the Tanzanian route and have pension funds used to fund the building, then collect rent. The ministry had put in a Sh186 million request for new vehicles both in Nairobi and in Kenya’s missions abroad, but Treasury only allocated Sh31.7 million. The Treasury, Mr Wetang’ula said, had promised to hand over some of the vehicles surrendered by ministers when the government bought the 1800cc VW Passats, but then this was not implemented. This followed Mr Nyamweya’s query on how the ministry felt about the much-publicised tour of US Vice President Joe Biden, when Mr Biden’s cars were flown all the way from Washington. “We need a protocol fleet, because this is a major centre for many summits and conferences,” he said. The rigid procurement laws were also part of Mr Wetang’ula’s grouses before the committee. The minister hopes that if the ministry is moved to the National Security docket, then more funds will be allocated. With 36 days to August 4, regional positions on whether to go Green or Red are becoming clearer as both the Yes and No camps accelerate their vote-hunting tempo. It is also emerging that regions are taking collective positions on the plebiscite as a result of various contentious issues such as the land question, abortion and Kadhi courts, but above all, political interests ahead of 2012. A Synovate poll carried out between May 22-28 among 6,017 respondents had showed issues of abortion (55pc), Kadhi courts (37pc) and land (32pc) were the major reasons that the No respondents cited for opposing the Proposed Constitution. While Nyanza and Western provinces have demonstrated they are predominantly for Yes, the neighbouring Rift Valley Province is firmly a No zone. Central and Eastern provinces are regions without clear indicators of where the people's stand is, as is Coast Province. While North Eastern Province is likely to vote Yes due to the Kadhi courts inclusion in the Proposed Constitution, Nairobi Province, being cosmopolitan as it is, equally lacks clear indicators of which camp will carry the day. University of Nairobi political science lecturer Adams Oloo said majority in Central Province are likely to vote Yes due to the Kibaki factor and a reforming Uhuru Kenyatta, while Eastern Province will play swing vote. "Because Kibaki has clearly stated he is for Yes and pressure on Uhuru has been immense going by the happenings at the Limuru meeting, Central will most likely vote for the proposed new law," said Dr Oloo. Oloo said parts of the larger Meru and Ukambani may vote No due to stepped-up campaigns in the area by the No camp, making the province a swing voteâ€™. It has been rare for Western Province to take a common position on any national issue given deep-rooted interests fronted by some elected MPs over the years, but this yearâ€™s national referendum seems to be an exception. With more than 20 elected MPs backing the Proposed Constitution save for Lugariâ€™s Cyrus Jirongo and Mt Elgonâ€™s Fred Kapondi, August 4 may provide the second opportunity in multiparty era for the region to vote as a bloc. The situation is a total contrast of the 2005 referendum, when former ministers Mukhisa Kituyi, Musikari Kombo, the late Newton Kulundu backed by former Vice-President Moody Awori led the Banana campaigns, while current Deputy Prime Minister Musalia Mudavadi, who was then outside Parliament, led the Orange brigade. Mudavadi and Saboti MP Eugene Wamalwa, who enjoys support among the youth across the province, are key in delivering the Yes votes in the region this time round. The Yes camp pitched tent in the province on Friday and Saturday with rallies in the key towns of Bungoma and Kakamega. In Luo Nyanza, support for the document is a foregone conclusion due to the immense influence of the PM. In Kisii, Education Minister Sam Ongeri and his Public Works counterpart Chris Obure are equally pulling towards Yes. Former Assistant Minister Wilfred Machage is the most visible No campaigner across Nyanza Province. In Central, Uhuru who is also a Deputy Prime Minister has in recent days been accused of not leading from the front in campaigning for the Proposed Constitution. While President Kibaki declared from the word go he was for the proposed new law, Uhuru had initially announced he would stay away from the campaigns, warning that they would inflame tribal hostilities and split the country, as witnessed after the 2007 election. However, after the Limuru conference by Central Kenya leaders last week, Uhuru has vowed to lead from the front by campaigning for Yes. In Eastern, while the Meru and Embu regions are more of a Central Kenya extension through the Gikuyu, Embu, Meru (Gema) Association, Ukambani is proving to be a fishing ground for votes by both camps. While Vice-President Kalonzo Musyoka and Water Minister Charity Ngilu are fronting for Yes in Ukambani, Mutito MP Kiema Kilonzo and MPs Victor Munyaka and Peter Kiilu are flying the No flag. Meanwhile, Ruto has cordoned off parts of the expansive Rift Valley Province, where he has strong following. Despite efforts by ministers in the Yes camp such as Sally Kosgei (Agriculture), Franklin Bett (Roads) and Henry Kosgey (Industrialisation) to change the tide, Ruto has maintained a strong grip over the North and South Rift regions. In Coast most ODM MPs are supportive of the Proposed Constitution, save for Special Programmes minister Naomi Shaban and a section of church leaders opposed to Kadhi courts. Muslims along the Coast have expressed strong support for the document as has North Eastern Province where Islam is the dominant religion. It remains to be seen how regional positions will shape up come August 4, the day the country may break from the past or maintain the status quo. The Kenya National Union of Teachers warned that it will take “drastic constitutional measures” against the government if their 60 per cent salary increment agreed on is not honoured. Knut described the delay in implementing the salary increment as a “provocation” and demanded funds be released to facilitate it “before we are provoked further”. Secretary-general Lawrence Majali said they had agreed that the government would pay 40 per cent of the salary increment in July 2009 and the remaining 60 per cent next month depending on the performance of the economy. “Due to the effects of the post-election violence and global economic downturn last year, we respected the government and agreed to receive only 40 per cent. “Now that the economy has improved as everybody can see, we want the government to also respect teachers and pay the remaining 60 per cent,” said Mr Majali. The secretary-general said teachers had agreed to receive even 40 per cent in July this year and the other 20 per cent in 2011 if the economy was not doing very well. Mr Majali was addressing journalists in Malindi on Monday, where he also reiterated that Knut will not accept employment of teachers on contract basis. He said: “The suggestion to employ teachers temporarily is a government ploy to engage cheap labour from trained and qualified teachers. We will not accept it”. He said the government should stop referring to the teachers as interns as they had been trained and qualified. Money should be released to the Teachers Service Commission to employ the teachers, he insisted. Justice Minister Mutula Kilonzo says he would lead the government in opposing a motion by Kigumo MP Jamleck Kamau that seeks to compel the government to stop the August 4 referendum to allow for talks between the Yes and No teams. The Motion seeks to get consensus over the contentious issues of land, bill of rights and Kadhis' courts that have been raised by the No camp. Mutula says Kenyans should be allowed to make the decision to vote for or against the proposed Constitution in the referendum. The minister further warned of a constitutional crisis if the proposed constitution is rejected at the referendum. He said a rejection of the draft would not only stall key reforms but also hamper the formation of an electoral body to oversee elections in 2012. "If we reject the constitution we will then not have an electoral body since the existing one is interim... There will therefore be no electoral body to conduct the 2012 elections which must take place after 28 months," he said. The Interim Independent Electoral Commission has a life-span of 12 months under the current constitution and this ends in December 2010. This can only be altered through a constitutional amendment to the current constitution which requires a two-thirds majority. However, the proposed constitution extends the life of the IIEC until the new Independent Electoral and Boundaries Commission is established. He was speaking shortly after receiving a 102 million grant from the Japanese government towards civic education. Shiego Iwatani, Japanese ambassador to Kenya said Japan supported the referendum as it was crucial in solving the Agenda 4 issues of the National Accord and the stability of the nation. "The Government of Japan hopes that utilization of the counterpart funds will contribute towards awareness of the proposed constitution, increase public participation in the review process and increase knowledge of the contents of the proposed leading to a peaceful and successful referendum where the voters would be able to make informed choices," Iwatani said. A senior officer with the National Security Intelligence Service (NSIS) was shot dead by unknown gunmen Sunday evening in Bondeni area Mombasa. According to the Coast deputy Provincial Police Officer Kipkosgei Barmao, three armed men reportedly blocked the slain officer's car as he was driving from a wedding ceremony at about 8 pm and shot him nine times before escaping. Barmao said the officer identified as Ali Abouth was rushed to the Mombasa hospital where he was pronounced dead on arrival. He said nine spent cartridges which were recovered from the scene of the crime and taken to the ballistic experts for examination and testing. The police boss said although no suspects have been arrested, police had launched investigations into the brutal murder. Reacting to the incident, nominated MP Sheikh Mohamed Dor and a senior Muslim cleric sheikh Shariff Khitamy of the supreme council of Kenya Muslims have asked the government to beef up security especially along the porous border. The two leaders attributed the sporadic crime activities in the region to the proliferation of illicit arms into the country and asked the security apparatus to seal the porous borders. Bishop Margaret Wanjiru's tenure as Starehe MP will be known on 30th of next month when the High Court will give its final verdict. The election petition against Wanjiru who is also the housing assistant minister was filed by former area MP Maina Kamanda. The High Court will me making its sixth judgment on election petition filed since the general election 2007. Lawyers representing both parties in the suit made their final submission Monday with Kamanda's lawyer claiming the election were rigged in favour of Wanjiru. According to a vote recount conducted in April this year BishopWanjiru trailed Kamanda by a margin of 14-thousand votes. The vote recount showed Kamanda leading with 49,308 votes against Wanjiru's 34,871. The scrutiny registered several anomalies ranging from failure by the presiding officers to sign Form 16A. The exercise began on February 24 with between seven and eight ballot boxes being scrutinized daily. It was also discovered party agents failed to sign the forms as required by law and no reason was given. From the outcome of the scrutiny, 35 ballot boxes could not be traced to any polling station. Kamanda moved to court immediately after the results were announced seeking a redress claiming the whole election was riddled with irregularities. Juja MP George Thuo was the latest casualty in Parliament to lose a petition after Joel Onyancha (Bomachoge), Omingo Magara (South Mugirango) and Chirau Ali wa Mwakwere (Matuga). Magara lost his seat to Ford People's Manson Nyamweya who was elected the new Member of Parliament for South Mugirango after garnering 14,099 votes in a by-election held on June 10th. The fate of former Transport Minister Mwakwere will be known in two weeks time. The Interim Independent Electoral Commission (IIEC) has set the by-election for July 12th. Candidates campaigning for the Matuga parliamentary seat by election are now using every strategy to woo voters. The candidates are now traversing the region in a door to door campaign with just two weeks remaining to the vote which is slated for July 12. The seat has attracted three candidates with former transport minister Chirau Ali Makwere fighting to reclaim the seat he lost in a petition. On Tuesday ODM party's big guns led by Prime Minister Raila Odinga and lands minister James Orengo will be in Matuga to rally support for the party's preferred candidate Hasssan Mwanyoha who will be making his third attempt to claim the seat. Mwanyoha is campaigning on the platform of a stolen vote claiming he won the seat in 2007 but he was rigged out. The ODM flag bearer over the weekend held door to door campaigns within 11 villages urging the constituents to vote for him. Ali Hassan Joho and a host of other MPs who accompanied Mwanyoha told the constituents to pick him as the forthcoming by-election was an opportunity to correct irregularities that marred the 2007 election. Mwakwere on the other hand was at Tiwi area where he told journalists that he would not be holding any campaign rallies to try to defend his seat since his development record spoke for itself. But it emerged that Mwakwere has been holding door-to-door campaigns since a court ruling nullified his election as Matuga MP in February. NAIROBI, Kenya Jun 28 - A consultative forum for Members of Parliament supporting the enactment of the proposed Constitution on Monday denied any divisions within its ranks as campaigns for the proposed law geared up. The meeting - which attracted over 130 MPs – was chaired by President Mwai Kibaki and Prime Minister Raila Odinga. It was called to stem apparent internal dissent in the group which threatened their efforts to push through the proposed law. Speaking after the two-hour long meeting, President Kibaki said: “I assure the Kenyan public that the ‘Yes’ parliamentary group was united in its desire to support Kenyans in their quest for a new constitutional dispensation." Dissatisfied MPs had called for solutions to various issues they were complaining about including lack of funds and campaign materials that was affecting their quest for a new Constitution. There has also been growing disquiet among members from the Party of National Unity who fear that Mr Odinga could use a Yes victory at the August 4 referendum to boost his anticipated 2012 presidential bid. President Kibaki who briefed the media for the first time said that the meeting resolved to undertake grassroots campaigns in every constituency soon after Parliament goes on recess later this week. The forum held at the Kenyatta International Conference Centre decided to form several campaign groups in order to reach all corners of the country ahead of the August 4 referendum. According to the secretariat co-convener Prof Anyang' Nyong’o, the groups will based on the 47 counties in the proposed Constitution. "Members said that they were confident of a ‘Yes’ victory and noted the need to mobilise Kenyans to turn up in large numbers and vote for the proposed Constitution during the August 4 referendum. The leadership of the ‘Yes’ campaign shall be divided into various groups in order to effectively target all corners of the country," the President said. The MPs committed to avoid divisive politics and to engage constructively with those opposed to the new law. He said: "The ‘Yes’ campaign shall remain truthful to the contents of the proposed Constitution and will not be dragged into campaigns that are not dwelling on the true contents of the Katiba". The MPs regretted that unlike ‘No’ Team, which appeared organised and ready for the campaigns, they had no funds for their rallies. The MPs further committed to engage with those in the ‘No’ team, who have reservations on a few issues in the proposed Constitution with a view to having them support the proposed law. NAIROBI, Kenya, Jun 28 - The Government has been given 10 days to respond to a case that seeks to stop the August 4 referendum on grounds that the constitutional review process has been marred by irregularities. The case filed by Kenyans for Justice and Development (KEJUDE) wants the Interim Independent Constitutional Dispute Resolution Court (IICDRC) to give guidance on how the entire review process should be conducted including civic education. The hearing which was initially set for Monday morning failed to kick off after the respondents asked for time to prepare their case forcing Lady Justice Violet Mavisi to re-schedule it for July 7. Okiya Omtatah who is the KEJUDE Director welcomed the adjournment saying all that mattered was the court’s hearing and final decision on the petition. “Let the court then rule; history will decide for itself. Because the court’s decision will be on record and the future generations will see. We must first obey the law before thinking of a new law and that way the country will take off,” he said. Earlier, the advocates representing the Interim Independent Electoral Commission (IIEC), the Attorney General and the Committee of Experts (CoE) and those representing the petitioners failed to agree on an appropriate date for the hearing compelling the Judge’s intervention. Wanjiku Mbiyu on behalf of the AG and Emmanuel Wetang’ula representing the IIEC had asked for a 10 and 14 day break respectively to adequately respond to the issues. “We were served last week on Friday and we did not have enough time to prepare ourselves and the issues raised by the petitioners need enough preparation and time,” argued Mr Wetang’ula. But in a quick rejoinder Andrew Muma and Charles Kanjama who were representing the petitioners said the respondents had enough time within which to organise themselves. They wanted the hearing date set for June 30. “The respondents have had three days to get ready and we oppose their application. We think the date for the hearing should be set three days from today (Monday),” said Mr Muma. Mr Omtatah also defended himself from accusations of being a busy body terming them ‘diversionary tactics’. “I have a clean track record that didn’t happen yesterday and if anyone thinks I can be used for anything else let them point it out. Anybody who says I’ve been ‘bought’ the challenge of proof is his,” he countered. Other petitioners in the case include Maximilia Munizwa, Ouma Odera, Frederick Odhiambo, Sarah Nyokabi and Prof Barrack Otieno. Only two civil societies (Center for Multiparty Democracy and Bunge la Wananchi) have applied to be respondent to the petition before the court. Mr Omtatah wants the Interim Independent Constitutional Dispute Resolution Court to determine 75 issues. Key among them is the failure by the IIEC to give Kenyans a multi question referendum. He also wants the court to address the issue of civic education alleging that the CoE is biased in its educative efforts. The CoE was not represented. NAIROBI, Jun 28 - The Prisons department has been thrown into a spin following last week’s court ruling which allowed the registration of inmates as voters for the August 4 referendum. Interviews with officials at the Prisons Headquarters revealed that senior officers have been meeting since Friday to iron-out pertinent issues arising out of the court ruling. Among the issues arising is how to determine who holds a valid Identity Card and those who may have been detained in juvenile centres and have now been transferred to maximum security prisons after attaining the age of 18. The Prison authorities also say they do not know if the court ruling is only binding to prisoners who were already in custody when the order was issued. “It is a major challenge facing us... the court ruling did not elaborate these issues,” one Prison warder at the Industrial Area Remand said. With only three days to go, prison chiefs have been holding daily strategy meetings since Friday to prepare a document listing their concerns before they sit for a round-table meeting with officials from the Interim Independent Electoral Commission [IIEC] and those from the Attorney General’s office later this week. “Those are major issues we want raised in the meeting so that we can get to know what exactly is supposed to be done,” said another senior officer whom we cannot name because he is not allowed to discuss policy matters with the media without the authority of his seniors. A source who attended one of the strategy meetings held on Monday told Capital News that security concerns had been raised, considering the shortage of warders in most prison facilities. There is also a general feeling that the one week given for the registration exercise is too short because of the large number of prisoners and prison facilities countrywide. There are about 65,000 inmates in all the 103 prisons countrywide but the IIEC has announced it will only gazette 70 of them as registration and voting centres. Prison officials who spoke to Capital News said they were yet to agree on what will happen to inmates in prisons which will not be gazetted by the IIEC. “The only available option is to transport the inmates to the registered centres, which is also a major challenge because of security and lack of enough vehicles and personnel to guard them,” one official involved in the logistics said. “We are in the process of laying down all the ground work. There should be no cause to worry. All that is supposed to be done will be done,” he said and declined to discuss details of the challenges they are facing. “All the necessary arrangements are being made and we will certainly be ready within the required time-frame,” he added. The prisons bosses are expected to meet with the IIEC and officials from the Attorney General’s office before Friday to discuss the modalities of registering the prisoners. The ruling to have all the inmates registered as voters was made last week in a case filed by the Kituo Cha Sheria lobby group which had moved to court to represent inmates from Shimo La Tewa who wanted to be listed as voters in the August 4 referendum. NAIROBI, Kenya, Jun 28 - Surveillance CCTV cameras installed in some of the city streets three years ago are out of order, after installations at the main control room were recently vandalised. The Sh42 million control room equipment at the National Archives was burgled, rendering cameras on Ronald Ngala, Tom Mboya and Moi Avenue mere objects of attraction. This has sent law enforcement agencies back to the drawing board because they were relying on the CCTV’s to monitor activities on the streets where the cameras have been installed. “The cameras have been helping us a lot. In fact, we will appreciate if they were to be installed in all the streets,” one junior police officer involved in daily patrols in town said. “We have succeeded in preventing a lot of crimes because of these cameras. It will be helpful if they are re-installed,” another officer said. The Nairobi Central Business District Association (NCBDA) which partnered with the City Council of Nairobi in the project said lack of the CCTV cameras in the city is a recipe for insecurity in town. “There is nobody thinking to have these cameras put back to their working condition, and the results will be disastrous. It is a basic requirement for crime management in this era,” NCBDA Chairman Timothy Muriuki said. “We rolled it out as a pilot project knowing it would help the police in the surveillance but now the cameras are no longer working because of the vandalism at the main station,” he added. When reached for comment, Director of City Planning Tom Odongo and the Public Relations Officer Wilfred Marube referred us to the Director of ICT Benta Otieno who was said to be out of the country. Mr Muriuki however, stressed the need to mobilise resources and revive the project in order to have all the city streets under surveillance to curb the increased rate of insecurity. “That is the only way we can be able to achieve our goals, the business community ought to get that assurance. They need to be assured of their safety,” he said. Mr Muriuki told Capital News the crime rate in the city had been cut down by a significant margin when the cameras were working but had now spiraled. He believes police could have relied on the CCTV’s to get to know culprits in the grenade attack that left six people and wounded 104 others at Uhuru Park three weeks ago. “It should not have taken the police this long to get to know who those attackers were, because if CCTV’s were installed all over the city, even the Uhuru Park attackers would be known by today,” Mr Muriuki said. Police are holding five suspects who are being interrogated over the attack but have still placed a Sh500,000 reward for anyone offering information which will lead to the arrest of the planners or attackers. NAIROBI, Kenya, Jun 28 - The City Council of Nairobi is expected to be fully automated in the next two years. Town Clerk Philip Kisia on Monday said that an effective information technology system would ensure that the council offers improved and efficient service delivery to city residents. He also outlined other areas of improvement which include debt restructuring and enhancement of revenue collection. He was speaking during the re-launch of City Hall’s Strategic Plan 2006 to 2012 where he stressed the need to concentrate on the implementation of its recommendations. The Plan is being re-launched so that focus can be on its implementation. “That document is not good if your customers do not feel you. If your customers do not tell you that yes, you have actually exceeded our expectations then that document has no value,” he pointed out. Speaking during the same function, Local government Permanent Secretary Karega Mutahi stressed the need for collective effort to be put in place to meet the goals set out in the plan. He explained that this would not only improve the council’s capacity to serve city residents in a timely manner but also streamline the sector. “This revised strategy has identified specific projects that will contribute to the achievement of relevant national priorities including infrastructure development, water and sanitation, transport and social amenities as well as enhanced public service delivery,” he observed. He further said that the private sector should be involved in the effective implementation of the plan. “I urge the council to develop public- private sector partnerships framework in order to attract and sustain more players from the private sector to enhance the level of service delivery,” he encouraged. Meanwhile, Finance committee chairman Michael Okumu has expressed the council’s commitment to increase its revenue base through debt collection. He urged those owing the council money to pay up or expect stern action to be taken against them. “There is a tendency that sometimes when money is being collected, people will always talk about harassment by the council. People will always make telephone calls to the ministry saying that they are being harassed by the council,” he said. He further called on the Local Government Ministry to give it a hand in revenue collection. “We only go to people who owe us money and if they do not want us to go there, tell them to come and pay and we will not visit any of them,” he said. The ‘Yes’ team is back to the strategy room to try and turn the tide against ‘No’ team and ensure it finishes first at the Finish Line on August 4. As part of the tactical manoeuvre, which also entails a process of self-audit, President Kibaki and Prime Minister Raila Odinga will on Tuesday lead the Grand Coalition Parliamentary Group in to trying to disentangle ‘Yes’ vehicle’s wheels from whatever gulley or mud-patch they deem they are stuck in or why they are moving too slow for comfort. But of utmost significance is revelation the meeting will also be used by a section of the ‘Yes’ wing to float the belated idea of postponing the referendum, ostensibly to allow consensus. Sources told The Standard that some MPs will make a last ditch effort to push for amendment of the Constitution Review Act to facilitate renegotiation of contentious issues. It also emerged this side will also try once again to fight for consensus on the divisive clauses threatening the birth of a new constitutional order. "I will try to reach Prime Minister Raila Odinga to brief him on the issue but I will make the proposal at the PG meeting because we would require the help of the two principals if these latest efforts of consensus are to be successful," said Kigumo MP Jamleck Kamau. A team leader told The Standard the PNU-ODM PG meeting to be held at Kenyatta International Conference Centre would endorse the splitting of the ‘Yes’ campaigns into smaller units. "Team leaders will be allowed to organise and conduct campaigns on their own schedule because there is a feeling that sticking together as one team is hindering its reach," said the highly placed source. He said they would ask that they be allowed to spread out like the Christian Church, which has split into many denominations and evangelical wings to cover wider areas while preaching the same gospel. This is a reversal of the earlier strategy of unified campaigns led by Kibaki and Raila, whose message was unity of purpose and determination to give Kenya a new constitution. In another new development, seen to be a bid to stem rising perception Kibaki and Raila had unleashed the State ‘machine’ to harass the ‘No’ side, the PM on Sunday strove to allay fears ministers opposed to the Proposed Constitution would be punished. Seemingly extending an olive branch to the Reds, even if only to assuage fears he and Kibaki were engaged in gunboat diplomacy, the PM assured Kenyans nobody shall be punished for holding divergent views. "We are not going to blackmail any Cabinet minister with threats of dismissal for campaigning against the constitution... so long as their campaign is based on facts and they do not incite communities against each other," he said when asked whether he would penalise ministers who use hate speech in their campaigns. "The ones who have been suspended know the reason they have been suspended and there are records to prove what they said to incite," he added. He, however, called on politicians to focus energies on the Proposed Constitution and stop dragging the 2012 campaigns into the referendum debate. "We are not dealing with candidates for the presidency in 2012... Kenyans can deal with that at the right time... It is the media which is dragging us to the 2012 campaigns but our focus now is the referendum on the Proposed Constitution," he said, adding: "It is only land grabbers who are making noise. The Proposed Constitution is 99.9 per cent good." Accompanying the Prime Minister was his wife, Ida who also implored the Church to pass the Proposed Constitution then institute changes later. In line with ‘Yes’ team’s plan for simultaneous countrywide rallies, Raila announced they would adopt a three-tier approach: national, regional and constituency-based rallies targeting the 47 proposed counties. As part of the renewed resolve to improve on its housekeeping, Deputy Prime Minister Uhuru Kenyatta, who was target of claims of ambivalence and indifference from Central Kenya leaders, chose to lead from the front as he had earlier promised. He asked Church leaders to compare the current Constitution to the proposed one and make an informed choice at the referendum on August 4. "This constitution is not like the Bible. It can be changed any time in future if need be. But first let us pass what we have," the Kanu chairman advised. Uhuru, accompanied by Nairobi Mayor Geoffrey Majiwa, Naivasha MP John Mututho and Embakasi MP Ferdinand Waititu rooted for the Proposed Constitution at a Catholic Church function. He argued church leaders and politicians should leave Kenyans to make their own mind on the review process. "I want you to ask yourself as an individual after you have read the Proposed Constitution: Is it good for this country or not? No one should make that decision but you," he said. It also emerged Vice-President Kalonzo Musyoka will also address the PG meeting scheduled to start at 11 am at KICC. Acting Government Chief Whip Johnstone Muthama sent out the invitations to MPs, The Standard learnt. At the last PG meeting five weeks ago, MPs and ministers deemed indifferent or wavering on the Proposed Constitution were put on notice. Efforts to amend the Constitution have been rejected in the past by both President Kibaki and Raila who argue changes would be made after the document is passed in August. The ‘Yes’ team led by Kibaki and Raila has insisted politicians opposed to the draft do not want a new Constitution. But in a rejoinder, Higher Education Minister William Ruto, who is leading the ‘No’ side, accused their detractors of insincerity. "Those alleging that the choice is between the old and the Proposed Constitution are misleading Kenyans because we decided collectively that we are all going for a new constitution," said Ruto. The problem, he said, was allowing desperation from some leaders and blackmail from the international community to pass a disputed document. Raila, who spoke at All Saints Cathedral, said: "In the ‘Yes’ team we do not have a leader, we have leaders... the country is huge and we need to cover the whole country so that we compare notes on the challenges we are facing." It is interesting that apart from a proposal to amend the Constitution, the meeting will also discuss the need for legislation setting out a roadmap for completion of constitution review. That is exactly what the Church and leaders in the ‘No’ camp have been agitating for since the draft was passed by Parliament in April. Attorney General Amos Wako then published the Proposed Constitution on May 6, setting the stage for civic education and campaigns for the referendum. When pushing for amendment, the Kigumo MP will request for the postponement of the referendum and reference of the Proposed Constitution to the reference group for consensus. Kamau has crafted the Constitution of Kenya (Amendment) Bill 2010 seeking to amend section 47A and also proposes amendments to the Constitution of Kenya Review Act to accommodate consultations and facilitate re-publication of the negotiated draft. The reference group is a statutory consultative body of 30 representatives chosen by interest groups to facilitate consultations in case of a deadlock on the draft between Parliament and Committee of Experts. ‘No’ team took Nakuru by storm as Church leaders returned to the campaign trail two weeks after their prayers at Nairobi’s Uhuru Park were rocked by as-yet-unexplained grenade explosions. In a show of solidarity, former President Moi, who is also against some clauses in the Proposed Constitution, joined 10 televangelists at the historic grounds for a moment of prayer, reflection and search for accord among Christians. Also present were 20 ‘No’ MPs led by Higher Education Minister William Ruto. Security was tight, and at the beginning the crowd was apprehensive given the explosions that claimed seven lives at Nairobi’s Uhuru Park prayers. Former Mungiki leader Maina Njenga, who has said he is in ‘Yes’ camp, made a surprise appearance at the meeting the preachers had described as solemn meeting to pray for the defeat of the proposed new laws. Njenga, who was widely acknowledged by Bishop Margaret Wanjiru, told journalists after the meeting that he was there as Christian to pray. "Do not speculate about my appearance. I am here only to pray," said Njenga who was seen chatting happily with the former President and other politicians in the VIP tent. Njenga has been actively participating in ‘Yes’ rallies saying he backs the proposed laws. Olympic Gold medalist Samuel Wanjiru also accompanied Njenga to the well-attended meeting. Hundreds of Christians, donning red T-shirts and caps, waved red placards and blew whistles as speakers made their speeches. The firmer Head of State expressed fears that the referendum could be rigged and told the ‘No’ campaigners to be vigilant. He questioned the registration of prisoners at the behest of the courts as voters saying it could be used to rig the referendum. "Why are they being registered now? How will people access prisons, which are restricted areas? The ‘No’ team should make sure they have agents in prison to guard against rigging," said Moi. The former President said the ‘No’ team should have alerted polling agents because it had emerged the voter register includes names of dead people. "There are 12 million registered voters but previously we had 14 million, which means that the tallying includes names of dead people," said Moi. He claimed that millions of shillings have been brought into the country to ensure the Constitution was passed. Moi told off critics who have been telling him not to speak on the constitution and promised to continue speaking his mind on issues affecting the country as along as he is alive. The former President said the Committee of Experts did not consider the views of Kenyans while drafting the document. "Those experts did not consider what Kenyans said they wanted included in the Constitution. They instead put their views that are currently causing problems," said Moi. The former President said foreigners had interfered with the constitution-making process and that those listening to them were being fooled. "Wewe ni mjinga kabisa unasikiza wazungu na kuweka mambo ambayo si ya Kiafrika kwa katiba. (Only the very foolish listen to foreigners who mislead you into putting into the Constitution things which are not African), he said. Moi said that Proposed Constitution was bad and would divide Kenyans further along ethnic lines. "A Constitution must unite the people and not divide them. This is a document for posterity and that is why it must be handled carefully," said Moi. He faulted the creation of 47 counties as proposed in the draft saying the economic implications had not been considered. The Church leaders restricted politicians from taking the microphone and only allowed Cabinet Ministers Samuel Poghisio and William Ruto to address the meeting. Ruto said the Government should listen to the Church leaders and warned that a country, which ignores its religious leaders, is headed for trouble. The Minister reiterated his position that changes should be made to the Proposed Constitution to avoid subjecting the country to a divisive referendum. "We should remove the ambiguities in the document so we can have a unifying Constitution," the Minister said. Ruto said those claiming the ‘No’ side does not want a new constitution had missed the point. "Those alleging that the choice is between the old and the Proposed Constitution are misleading Kenyans because we decided collectively that we are all going for a new Constitution," said Ruto. He repeated his earlier claims that some politicians were supporting the referendum so that they can use it in the 2012 campaign. "There are those people who think that passing the Proposed Constitution will give them a platform for 2012," alleged Ruto. Poghisio petitioned for the Church to be given a hearing on constitutional issues and to be taken seriously. "Ghana has achieved middle-income economy status because their leaders have stood with the Church and we are petitioning our Government to listen to the Church," he said. The Church leaders vowed they will not be intimidated by the Government and vowed to continue opposing the document. Bishop David Mureithi claimed that the Government had closed doors and accused politicians of abusing Church leaders. "For the first time we have leaders who are abusing the Church leaders and arresting pastors for preaching on the streets. This is sign of bad governance." Bishop Mark Kariuki said that by opposing the Constitution the clergy was not fighting the Government but was expressing its democratic right. Kariuki cautioned that Church leaders will not be cowed and will continue agitating for rejection of the Proposed Constitution. He said in 2005 Church leaders said No! to the Wako Draft and will reject the Proposed Constitution too as contentious clauses have been retained. "The issues that led us to say No! in 2005 are the same ones making us, say No! to the current document," he said. He warned that the Church would ask followers to boycott media houses that are not supporting their cause. "We will ask our people not to buy the newspapers and boycott all media houses which are hostile to the position taken by the Church,’’ he declared. Bishop Francis Musili said the Government had opened another battlefront following Parliament’s passage of a Bill legalising chang’aa. Political rivals battling for the Matuga parliamentary seat on Sunday continued their whistle-stop tours of the constituency as they drummed up support ahead of the July 12 by-election. Groups from ODM, PNU, the United Democratic Movement (UDM) and the Labour Party of Kenya (LPK) — which are fronting candidates in the poll — traversed the vast constituency bearing banners. They also sang in praise of their candidates. The race pits ODM’s Hassan Mwanyoha against PNU’s Ali Chirau Mwakwere, Mr Kassim Tandaza (UDM) and Isaac Mutula Masila of LPK. The candidates, who spoke to the Daily Nation, said they preferred door-to-door campaigns as opposed to public rallies as the former were more effective, especially in their opponents’ strongholds. Mr Mwakwere kicked off his tour on Friday with a special meeting with elders from Tiwi, an area perceived to be Mr Mwanyoha’s stronghold. “I have moved to more than 300 homes convincing them to re-elect me for what I have done for them in the past seven years,” Mr Mwakwere said. Mr Mwanyoha, on the other hand, held a meeting in Mr Tandaza’s home turf at Mwabunga. The ODM team also criss-crossed 11 locations, including Tsimba, Mwaluwamba and Kwale Town. ODM organising secretary Ali Hassan Joho said Coast MPs will continue with the village campaigns until July 2 before the party’s secretariat takes over. The UDM candidate decided to conduct his rallies within Kwale Town, where he held road shows and meetings. Mr Tandaza said all is set for the by-election. At the same time, police have urged the campaigners to maintain peace and hold rallies in areas permitted by officers. The Matuga parliamentary seat, formerly held by Mr Mwakwere, fell vacant on February 5, 2010, following a successful petition filed by a voter, Mr Ayub Juma Mwakesi. President Kibaki’s son Jimmy on Sunday gave the clearest indication that he intends to succeed his father as the Othaya MP. Saying he was not scared of other contestants, Jimmy said he will start his campaigns soon after the referendum. “It is too early to play politics, but after the referendum, we can begin campaigning properly,” he told a fundraiser at Witima Catholic Church in Othaya. He assured the constituents that the President is close to them and he had his father’s blessings to succeed him. The younger Kibaki has faced criticism for failing to clearly state his political ambitions even though he has taken up various development projects and held a string of harambees in aid of schools and churches in the area. To observers, the President’s eldest son has done everything an elected leader would do save for declaring that he is interested in that seat. President Kibaki, who appears aloof to issues of development, has left it to his son to run the affairs of the constituency, including those of managing the CDF kitty. The Head of State, who is the longest-serving MP, and has represented Othaya for close to 40 years, is expected to retire in 2012 after serving two terms as President of the republic. At the same time, the younger Kibaki rooted for the new law saying the devolved power would prevent presidential dictatorship. He also offered to arbitrate between the Church and government to help bridge their differences ahead of the referendum. “If at all you (Catholic Church) need my assistance to talk to the President so that you can reconcile on the constitution, I am at your service,” he said. He promised the Church that the changes they wanted enacted in the proposed constitution would be made before the President retires in 2012 and urged the clergy to support the document. Higher Education minister William Ruto on Sunday said that the proposed constitution would cause chaos in Kenya if it is passed in its current form. He challenged rivals in the ‘Yes’ camp to read the signs on the wall, saying that Kenyans were going to reject the proposed constitution during the August 4 referendum. “Let them open their eyes and their ears because Kenyans are making a statement so that we can move forward as one nation,” said Mr Ruto. Mr Ruto, who is the de facto leader of the MPs opposed to the new laws, stressed that the chapter on religion should be amended. He said it puts one religion against the other, adding that this was a recipe for chaos. The minister was speaking in Nakuru Town, where 16 MPs joined retired president Daniel arap Moi in a prayer meeting organised by church leaders opposed to the document. It was the first time Mr Ruto and Mr Moi shared the same forum to campaign against the document. On his part, Mr Moi questioned the ruling by the Dispute Resolution Court that allowed prisoners to vote in the referendum. He said this was a ploy to rig the vote in favour of the government. “This is a complicated world … the ‘No’ camp should be allowed to send their agents (to prisons) so that their vote is not stolen. They should keep an eye throughout the process,” said Mr Moi. Cabinet minister Samuel Poghisio also spoke during the rally. Others who attended include Dr Wilfred Machage, Mr Luka Kigen, Mr Zakayo Cheruiyot, Mr Cyrus Jirongo and Dr Julius Kones. The church leaders said they hoped to bring all Christians together to defeat the new laws. The function was also addressed by Bishop Mark Kariuki. A teacher on Sunday went berserk and killed his two-year-old son in Nyahururu Town. He also seriously injured his wife and three other young people. The 40-year-old teacher, who was frustrated after he was dismissed from Falling Waters Secondary School, returned home in the wee hours of yesterday morning and attacked his family. He locked the victims in the house before disappearing. They were his 27-year-old wife and their two sons, one of who later died of the injuries he sustained during the attack. Other victims were the assailant’s brother-in-law, aged two years, and her orphaned cousin. The victims were discovered seven hours later when one of the victims regained consciousness and called the teacher’s mother-in-law, who lives three kilometres away. The teacher’s wife was taken to hospital where she was admitted to the intensive care unit (ICU). Police have launched a manhunt for the accused after being alerted about the incident. A director of the school, Mrs Gitahi, said the teacher had been dismissed for absconding duty. The assailant’s wife had asked them to give the family time to look for another house. The incident took place as students of the boarding school were away on midterm holiday. The man is said to have served as a prison warder before joining the school. By the time of his dismissal from his teaching job, he had been promoted to the position of deputy head teacher. He also served as the school’s boarding master. Key issues during the rally included the benefits of county governments as units of devolution and the need to end abuse of power. Lands minister James Orengo announced that the title of the 5,000 acre land in Nairobi that had allegedly been grabbed by powerful individuals in the Moi regime has now been revoked. Alex Chamwada covered the rally and filed the report. Politicians opposed to the proposed constitution continued to rally Kenyans to reject it during the much awaited referendum and provide an opportunity to amend the contentious issues. The no brigade led by higher education minister William Ruto and his information counterpart Samuel Porghisio accused the proponents of the proposed constitution of misleading Kenyans that it will be easy to amend it when passed claiming that there are too much obstacles in law. The politicians who concluded their no campaign rallies in Ukambani stated that the proposed set of laws does not reflect the view of Kenyans. Chris Thairu filed the report. President Mwai Kibaki today led the yes brigade to Embu town. The president however steered clear of constitution politics and instead concentrated on issues of education. The President was at the St. Pauls High School in Kevote where the school marked its golden jubilee. Nevertheless the ministers who accompanied the President drummed up support for the proposed new constitution. Meanwhile Deputy Prime Minister Uhuru Kenyatta held another yes campaign in Meru district. Olivia Okech is on the trail of the yes camp and filed the report. Garsen MP Danson Mungatana has claimed the ‘No’ camp is planning to have the August 4 referendum suspended through the Interim Constitutional Dispute Resolution court. Mungatana said he has reliable information that those opposed to the new constitution were intending to move to court to seek orders to suspend the referendum and push for amendments. He was addressing a ‘Yes’ rally at Tarasa in Garsen Constituency today. The Narc-Kenya Secretary General urged the judges at the constitutional court to reject any attempt by the ‘No’ proponents to deny Kenyans a new constitution. "I appeal to the judges to read the mood of Kenyans and dismiss the ‘No’ proponents," he said. "My colleagues in ‘No’ camp are driven by selfish interests and they have realised Kenyans are eager to get a new constitution. That is why they are intending to move to court to stop†the exercise," he said. Prime Minister Raila Odinga on Sunday returned to the Anglican Church with the 'Yes’ message and, this time, he used the Bible to woo the congregation to the 'Yes’ camp. Mr Odinga and his wife Ida, were at the All-Saints Cathedral, where they waxed biblical on the need for the country to pass the new Constitution, saying the scriptures had many analogies on why the proposed law should be endorsed in the August 4 referendum. The Prime Minister cited 2 Corinthians 1: 18-20. There was laughter and clapping from the congregation at Mr Odinga’s political guile. However, just as he sat down, Anglican Archbishop Eliud Wabukala accused the PM of quoting the verse out of context. Archbishop Wabukala said the whole chapter was “addressing a leadership in a crisis” and the verse had nothing to do with the referendum debate, but rather with the promises of God. Archbishop Wabukala did not delve into the debate and instead insisted that it was important for the “church to stay united.” He said that beginning Thursday (July 1) the Anglicans will go into prayer mode, for at least five minutes at every service, to pray for the country. August 1, the Archbishop said, had been set aside to pray for the referendum. But before that, Ms Odinga had also used the Bible to tell the church that is was crucial to vote 'Yes’ on August 4 and then amend later. Ms Odinga said that just like it is difficult to separate seeds for unwanted plants before planting, it was important for Kenyans to let the seeds grow and then weed out the wild plants. “That’s why you should vote 'Yes’ and we amend later,” she said. In a jocular mood, the PM and his wife, had used the Bible to cajole the Anglican Church, hitherto firmly in the 'No’ camp, to the 'Yes’ camp. “Sometimes when I hear the church leaders saying the Church is for 'No’, I ask them, whom did they ask?” the Prime Minister told the congregation. Still the PM delved into the twin issues that the church is opposed to -- abortion and Kadhi courts. “The current law says, 'life begins at birth’, that’s why we issue birth certificates. The proposed Constitution says 'life begins at conception. We are the only country in the world to have that clause,” he said. He added that the Kadhi courts did not affect Christians. The Church has been opposed to article 26(4) that gives direction as to circumstances under which abortion may be permitted. The church also wants the Kadhi courts set up by an Act of Parliament and not the Constitution. Speaking later to journalists, he maintained that it was not a scare tactic to call the 'No’ camp 'land-grabbers’, because “they know themselves.” He said the call by the 'No’ camp that the name-calling was a scare tactic was meant to divert attention. Mr Odinga downplayed the seeming divisions in the 'Yes’ team saying he was not even threatened by the revival of the Gema outfit to push for the new law. “There’s no division. The 'Yes’ team does not have a leader, it has leaders. (Gema) is complementary to what we are doing,” he said. The referendum campaigns are the first time that the coalition government has publicly sacrificed the doctrine of collective responsibility in government at the alter of democracy. “We will not blackmail anybody. Every person has a right to decide based on their conscience,” Mr Odinga said. But there’s a rider to that: The 'No’ team should not use inciting words in their campaign meetings or else the law will take its course. He didn’t comment further on the hate-mongers in the 'No’ camp who’ve already been arraigned in court saying doing so will be sub-judice. New York, Jun 27 : The United Nations Office on Drugs and Crime (UNODC) and Kenya, the country currently holding the highest number of piracy suspects, have opened a new high-security courtroom to try suspects in the port town of Mombasa. "Kenya has taken on a heavy burden in dealing with a crime that affects the entire international community," said John Sandage, Officer-in-Charge of UNODC's Division of Treaty Affairs on Saturday. "Today's event is a recognition of their commitment and a demonstration of solidarity from the international community," he said. The new courtroom -- intended to increase trial efficiency in the system and provide a secure, modern environment suitable for piracy cases -- was built by UNODC's Counter-Piracy Programme with contributions from Australia, Canada, the European Union (EU), France, Germany and the United States. It is designed to hear cases of maritime piracy and other serious criminal offences. "There are no V.I.P. prisoners and there are no V.I.P. defendants: all the improvements have impact on everybody in the criminal justice system," Alan Cole of the Counter-Piracy Programme at the regional office of UNODC told UN Radio. He added that the courtroom is one part of international efforts through UNODC to improve conditions in Kenya and improve capacity of the country's justice system "so that as many pirates as possible can be given as good a trial as possible without any additional load on the Government of Kenya." Some 123 suspected pirates have been held in Kenya, of which 18 have been convicted and 105 remain on trial. The majority were arrested in the Indian Ocean, off the coast of Somalia, where the fragile Transitional Federal Government (TFG) is unable to securely hold and try them. tougher legislation to prosecute and jail suspects. There are also plans to create a regional trial centre in the Seychelles, which is currently holding 31 suspects apprehended by the EU Naval Force Somalia -- Operation (EU NAVFOR). Despite international naval patrols, "the attacks continue, indeed, they are increasing," Secretary-General Ban Ki-moon told the General Assembly last month. Over the four years until 2009, there was a seven-fold increase in piracy incidents off the coast of East Africa, and a global jump in incidents from 100 in 2008 to 406 in 2009, according to UN International Maritime Organization (IMO) global figures. The Interim Independent Electoral Commission (IIEC) will start registering prisoners as voters this Friday. The exercise, brought by the Wednesday's ruling by the high court allowing inmates to participate in the forth coming referendum, will target 40,000 prisoners. Speaking at the weekend in Garissa, IIEC Chairman Ahmed Isaack Hassan urged Kenyans to remain united irrespective of the outcome of the referendum. The IIEC, he said, will gazette 70 prisons across the country as voter registration centres and polling stations starting early next week. He added that those with huge numbers of prisoners will have two streams, one for women and the other for men. A five judge bench on Wednesday directed the electoral body to register the inmates in the next 21 days starting Thursday. Only inmates who are of sound mind, age of 18 and have their Identification cards qualify to register for the referendum set for 4th of August this year. The suit had been filed by inmates from Shimo La Tewa. Section 43 (c ) of the current constitution disqualifies convicts from voting in a presidential, parliamentary and civic elections but the convicts told the Court that the section of the law does not bar prisoners from participating in a referendum. Through Kituo Cha Sheria, a human rights lobby group, the prisoners argued that barring them from the plebiscite to accept or reject the proposed constitution was unconstitutional and a violation of their rights. The no team was in Nakuru where Higher Education Minister William Ruto denied claims that his team was being funded by foreign churches. "We have not received a coin from anybody. We don't believe that you can buy citizens to change their stand. Those who believe in buying people are actually the ones who want money as they tried to make it a government project," Mr Ruto said. Deputy Prime Minister Uhuru Kenyatta was at another church fundraiser in Dandora. Uhuru reached out to the congregation by urging them to vote yes come August fourth. Uhuru said Kenyans should not allow politics get in the way of a new law that is much better than the current constitution. ACK Archbishop Eliud Wabukhala called for divine intervention saying it was important that Kenyans remain united even after the outcome of the referendum. He was speaking on Sunday at a funds drive at the All Saints Cathedral in Nairobi where Prime Minister Raila Odinga was the chief guest. The Arch bishop said that beginning Thursday (July 1) the Anglicans will set aside time in every service to pray for the country and the forthcoming referendum. The Prime Minister and his wife Ida urged the congregation to endorse the draft constitution. He spoke on contentious clauses on abortion and Kadhi courts which the church is opposing saying kadhi courts did not affect them. "The current law says, 'life begins at birth', that's why we issue birth certificates. The proposed Constitution says 'life begins at conception. We are the only country in the world to have that clause," he said. The Premier expressed optimism for a new constitutional dispensation on the basis that Kenyans were now reading the proposed law objectively. Anglican bishops have been divided on whether to back or reject the Proposed Constitution at the referendum. Last week the Catholic Church also called for a day of prayer as voters consider their stance on a referendum on the country's draft constitution. In a letter read at Masses throughout Kenya, Cardinal John Njue of Nairobi, chairman of the Kenya Episcopal Conference, asked that prayers be offered to seek God's guidance during a particularly trying time in the country's history. "As a country we are praying for a peaceful referendum and campaign to continue without dividing Kenyans on tribal lines," Cardinal Njue said. Church leaders have opposed the draft constitution, which includes clauses they believe could lead to the legalization of abortion and the entrenchment of Islamic courts. MP’s advocating for the proposed constitution took their YES campaign to Samburu district where they continued to express their confidence in the document and its ability to sail through in the referendum vote. Industrialization assistant minister Nderitu Mureithi, (M.P Laikipia West), Abdikair Mohammed (Mandera Central) and nominated MP Maison Leshomo said it was unfortunate that some of the leaders opposing the enactment of the new law were involved in its drafting. “Why should someone criticize a document in which he was actively involved in drafting. These people owe Kenyans an explanation,” Mr Mureithi said. Mr Abdikadir who is also the chairman of the Parliamentary Select Committee on the Constitution Review said: “We want to assure that the integrity of the process is fine and the document that will be put to the referendum is one of the best that Kenyans can have, but I don’t believe there is a way we can withhold the referendum until we all agree on one course”, he said. The leaders spoke at the Maralal stadium in Samburu central district on Sunday during a fund raising ceremony to support various women groups from the region. NAIROBI, Kenya, Jun 27 - Prime Minister Raila Odinga said Sunday he was not worried about the newfound GEMA unity and instead welcomed it as a major boost to the YES team spearheading the proposed constitution. He termed reports that the group led by one of his deputies and Finance Minister Uhuru Kenyatta was out to overshadow his campaign strategy were “unfounded and far fetched”. “Let it be known that the YES team does not have a leader, it has leaders, so we are not worried and we are focused on the draft constitution,” he said. He said the move by the Gikuyu, Embu, Meru Association (GEMA) was a step in the right direction. “As far as other people organize themselves to campaign more effectively for the YES vote, it is complimentary to what we are all trying to do. Let us not try to bring in the 2012 issue for the YES vote,” Mr Odinga told reporters after attending a church service at the All Saints Cathedral in Nairobi. Some factions allied to the YES team have openly been expressing their frustrations claiming that they had been locked out of the campaign management by President Mwai Kibaki, the Prime Minister and Vice President Kalonzo Musyoka. This led to Friday’s formation of a unity force by Central Kenya leaders led by Mr Kenyatta ahead of the national referendum on August 4. “Kenya is considerably a big country, and it is to the advantage of us all when we have different groups forging a unity of purpose in the YES team,” the Prime Minister said. In his brief remarks at the All Saints Cathedral, the PM urged the congregation to disregard rumours being peddled by the NO team and vote for the proposed constitution. “We want to carry out a professional campaign based on facts, we don’t just want to engage in cheap propaganda like what they are saying that this draft constitution legalizes gay marriages, you ask yourself which chapter and verse of the constitution talks about gay marriages,” he asked. President Kibaki has announced the Government will employ more teachers under the Economic Stimulus package to address teacher shortage in the country. "I am aware that the shortage of teachers in our schools is a challenge we must deal with. Nationally the shortage of teachers stands at approximately 43,000 in primary schools and 23,000 in secondary," the President said. This comes a week after head teachers called upon the Government to revoke its policy to hire interns as well as merge schools that have few students. Last week, Kenya Secondary School Heads Association (KSSHA) National chairman Cleophas Tirop said the move, which he described as short-term measure to curb the shortage, would provide a win-win solution for the unions and Government. While speaking at St Paul's High School, Kevote in Embu, the head of State emphasised that teachers are the most important resource in education and the Government will address this challenge. Kibaki reaffirmed the Government's commitment to providing quality education and training for all. "We appreciate that the development of our nation and the well being of our people will largely depend on the education policies that we pursue," said Kibaki. President Kibaki added that the Ministry of Education is closely working with other education stakeholders to promote quality education, training and research. He commended the Ministry of Education and other stakeholders who, for the last two years, have been organising a national secondary school leadership conference that brings together students from different districts to discuss issues affecting them. The Head of State noted that during this year's national secondary school leadership conference, over 1,000 students met at the Bomas of Kenya and discussed issues pertaining to conflict resolution, governance, drug and substance abuse. On Free Primary Education, President Kibaki said the Government in partnership with other development partners has disbursed Sh54 billion to over 18,000 public primary schools since the introduction of the programme in 2003, while Sh34 billion has been disbursed to 5,300 public secondary schools through free tuition Secondary Education programme since 2008. The choice at the August 4 referendum will be between voting ‘Yes’ for a divisive, controversial and ambiguous document or ‘No’ for a chance to correct it, Higher Education Minister William Ruto has said. Mr Ruto who is leading opponents of the proposed constitution said it is wrong for the ‘Yes’ team to claim the choice will be between the old and the proposed laws. “They have missed the point. They are misleading the public. The choice on August 4 will be voting ‘Yes’ for divisive document with controversial clauses on religion, counties and devolution and ambiguous clauses on land. On the other hand voting No will be to enable us give ourselves an opportunity to correct the clauses and enact the constitution that will unite Kenyans,” Mr Ruto said. Speaking on his way to Nakuru for a ‘No’ rally, Mr Ruto said all Kenyans require a new constitution but a proper one and that only voting ‘No’ will allow the removal of contentious issues. “No one can hoodwink Kenyans to vote for controversial, ambiguous and divisive document,” he said. At the same time, Mr Ruto has denied reports that his team was being funded by foreign churches. The minister said the claims by Prime Minister Raila Odinga during a ‘Yes’ rally in Kakamega on Saturday as primitive, retrogressive and an act of desperation after sensing that the 'No' side was headed for a win. “We have not received a coin from anybody. We don’t believe that you can buy citizens to change their stand. Those who believe in buying people are actually the ones who want money as they tried to make it a government project,” Mr Ruto said. The Eldoret North MP added that it is also US Vice-President Joe Biden who was in the country recently on invitation by the government who had promised Kenyans money and other handouts if they passed the proposed constitution. He said Kenyans will vote on proposed constitution on basis of its contents adding that the debate should be limited to them. “People should know there’s no yard sale, an auction or markets in Kenya to buy people. Kenyans are objective and are going to make informed decision. To allege that anti-Muslims organizations are funding ‘No’ team is propagating hate speech and creating animosity among them,” Mr Ruto said. He said the ‘No’ team did not even have materials for campaigns except its symbol the Red Card and that its little finances came from local well wishers. Addressing a ‘Yes' rally in Kakamega, Mr Odinga said those opposed to the proposed constitution were receiving millions of shillings from church organisations based in America and Europe. The money, he said, was being used to fund campaigns meant to confuse Kenyans about contents of the proposed constitution. Meanwhile, Mr Ruto described the ‘No’ team Friday and Saturday rallies in Ukambani as successful. He said his team will be visiting all parts of the country to seek for support. KUALA LUMPUR – Kenyan long-distance runner Nelson Kirwa Rotich won the Standard Chartered KL Marathon 2010 today, clocking a new record of two hours 16 minutes and 44 seconds in a wet race around the national capital. The previous record was 2'17:2s held by Julius Kilimo Kipkorir, also from Kenya. Rotich's countrymen Lilan Kennedy Kiproo and Luka Kipkemboi Chelimo finished second and third respectively, with a time of 2'16:55s and 2'16:56s in the race which started and ended at Dataran Merdeka. Rotich, who was last year's runner-up, won US$17,500 (RM56,753). Kiproo and Chelimo each took home US$8,000 (RM25,944) and US$5,000 (16,215). Meanwhile, Rotich said many runners were not prepared for the rainy and slippery road condition. "I learnt from past mistakes and made sure not to repeat them this time around," he said. A total of 16,500 runners took part in the marathon which offered prizes worth US$100,000 (RM350,00). The prime minister's wife, Rosmah Mansor, presented the prizes. NAIROBI, Kenya, Jun 27- Christian lawyers have faulted the proposed new constitution over the high thresholds it has placed on key chapters claiming they were too rigid. The lawyers who have asked Kenyans not to sacrifice their moral values at the expense of a new law also said the amendments ought to have been done before the publication of the draft. Chairperson of the Kenya Christian Lawyers Fellowship Ann Mbugua on Saturday said it would be difficult for Kenyans to make any changes to the proposed law as they would have to be through popular representative initiative. "The counties will be constituted after 2012 which means for any amendment to be done, we will have to wait for 2012. Let's come to the issue like of abortion; how many children will have been killed before we decide to amend? Some people will suffer irreparable damage because of the delay of amendments," she argued. Ms Mbugua added that the country lacked political will that would help ensure any sought amendments. "Marshalling Parliament to amend the constitution is almost impossible. If you consider what happened in Parliament on the day they were supposed to consider the over 200 amendments then you realize we do not have the political commitment to take us through this process," she said. Ms Mbugua who was speaking after a meeting for African Christian Lawyers also said that they (Christian lawyers) remained hopeful for a consensus on the contents of the proposed law. "We all desire a new constitution especially because of the governance reforms it will bring but we are being forced to reject it because we have no other option. If we can still discuss these issues and resolve them then we will all get on the same boat," she said. South African advocate Teresa Conradie also urged Kenyans not to vote for the proposed law until they were certain about its contents. "Make sure that it will not be necessary to make amendments to the constitution very soon. The South African constitution was adopted in 1997 and 13 years later there have been no significant successful amendments. It would be naïve for Kenyans to believe that it will be easy to change things," she said. She further said that a homegrown constitution would be the best option for Kenyans as it would effectively meet their needs. "There are a lot of clauses in Kenya's proposed new constitution that come out of the South African constitution whose contents in turn came out of the Canadian constitution. We have found in South Africa that because our constitution was borrowed from a North American source that there are clauses we do not feel comfortable with," she cautioned. Kenyans were also asked to remain patient and steadfast in their search for a new law. What is Gema up to?